A diabetes diet should have the goal of making long-term diabetic complications LESS likely, but mainstream advice doesn't always follow that logic. The 2018 ADA guidelines tell people with diabetes to limit fat and keep protein at about 25% of total calories. That leaves 45-65% of total daily calories from carbohydrates. (See this document). Based on a daily calorie intake of 2000 calories, that works out to 225-325 grams of carbohydrate per day. Type 2 diabetes is basically a disease of carbohydrate intolerance, so this advice doesn't make sense. Eating large amounts of carbohydrate causes blood sugar to spike, which the requires a large amount of insulin to bring it down. The result is that blood sugar crashes. We call this the blood-sugar roller-coaster. More medication and more insulin is needed to control those roller coaster highs and this increases the cost of diabetic care and the likelihood of diabetic complications. The logical solution is to get off the blood sugar roller coaster completely. Following a low-carb, high fat ketogenic diet stops this blood sugar spike/crash cycle and in many cases, helps you reduce or even eliminate the necessity for medications such as metformin. It can also greatly reduce insulin needs. Conquer Type 2 Diabetes with a Ketogenic Diet provides the practical information you need to implement the diet while managing insulin and diabetic medication needs. 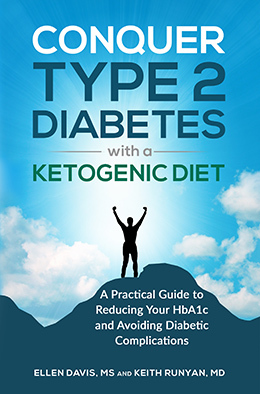 Coauthored with Dr. Keith Runyan, a physician who treats his own type 1 diabetes with a ketogenic diet (with the result of an HbA1c of 5.0) the book contains over 200 pages of referenced, applicable information on getting off the blood sugar roller coaster and minimizing the risk of low blood sugar and diabetic complications. The Conquer Type 2 Diabetes with a Ketogenic Diet eBook is an electronic book in Acrobat PDF format. It will be delivered as a downloadable PDF file via a digital link in an email*. Payments secured. Pay by PayPal or credit card. *You will need the free Adobe Reader to read the book on a PC/Mac. Also, if you plan to open the book on an iPhone or iPad, you will need the free iBooks app or other PDF reader on the device to access the book. Want a Preview? Not sure this diabetes diet eBook is for you? Click here to download a "Quick Peek." You can view the Table of Contents, some introductory information and references. In addition, there's an independent review of the book here. This book is also available in paperback on Amazon.com here. How exercise works with the diet and much more! Why Offer a Ketogenic Diabetes Diet Book? Dr. Runyan and I researched and wrote this eBook because so many people with diabetes are unable to control their blood sugars and avoid long term diabetic complications following the advice provided by diabetic organizations such as the ADA. It IS possible for people with diabetes to control their blood sugars successfully, and avoid high and low blood sugar dangers just by making the switch to a ketogenic diet. Dr. Runyan is a type 1 diabetic and has had total success using a ketogenic diet as his primary diabetes diet. His blood sugars and HbA1c tests are normal, and he does not suffer from hypoglycemia or worry about future complications. He shares his story in the book, and I think it is particularly compelling. While the implementation of a ketogenic diet for diabetes should be monitored by a qualified and knowledgeable health professional, many physicians are still unaware of the basics on how to implement a ketogenic diet for diabetics, despite the strong research which supports this treatment. See this paper for a complete review of the research. We feel that many people need help with basic questions on the process, and those questions are answered in this book. We've also included tons of information on managing blood sugar and insulin therapy in the confines of a ketogenic diet. We think you will find this book extremely valuable if your goal is to take control of your diabetes.